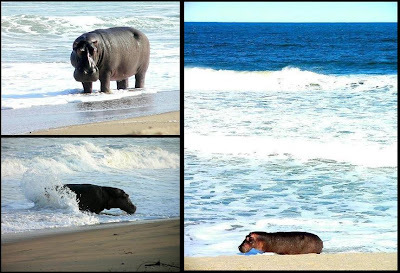 Hippopotamuses surfing in the sea may seem as improbable as polar bears gambolling across the desert, but as the remarkable photograph above readily demonstrates, in the world of nature few things are even impossible, let alone merely improbable. 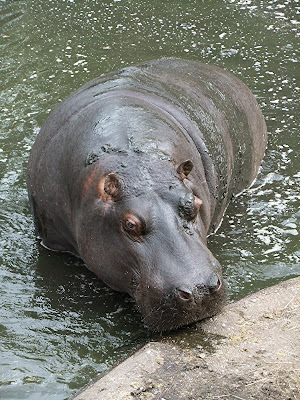 For although the common hippopotamus Hippopotamus amphibius is traditionally associated with freshwater habitats, such as rivers and lakes, it does also frequent saltwater in certain localities. These include the southern Orango group of islands, part of the Bijagos Archipelago in the Atlantic Ocean off the western coast of Guinea Bissau (formerly Portugese Guinea) in western Africa, which are now a national park. Saltwater hippos occur off the Kenyan island of Manada Toto too, and - the location of the stunning photo here - in the Petit-Loango Reserve in southwestern Gabon. Here, the hippos spend much of the day taking their ease in swamps and lagoons close by, but emerge at dusk to graze upon grass along the beach and indulge in boisterous surfing safaris out to sea. What makes such scenes even more extraordinary than their mere setting is the fact that despite being intimately associated with water, hippos are far from being the animal world's most competent swimmers. Indeed, even though their massive bulk (they are beaten in the heavyweight stakes among terrestrial mammals only by the elephants and some rhinoceroses) is effectively buoyed by their aqueous surroundings, these gargantuan cousins of pigs and peccaries (but actually most closely allied to whales, dolphins, and other cetaceans) often do not venture into expanses of lake or river deeper than their own bodies. 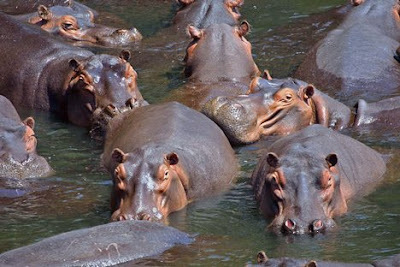 Even hippos seen with just their heads above water are, in reality, usually standing on the riverbed or lake bottom, stretching their necks to keep their heads above water, ably assisted by the evolutionary relocation of their eyes, ears, and nostrils close to the top of their heads. 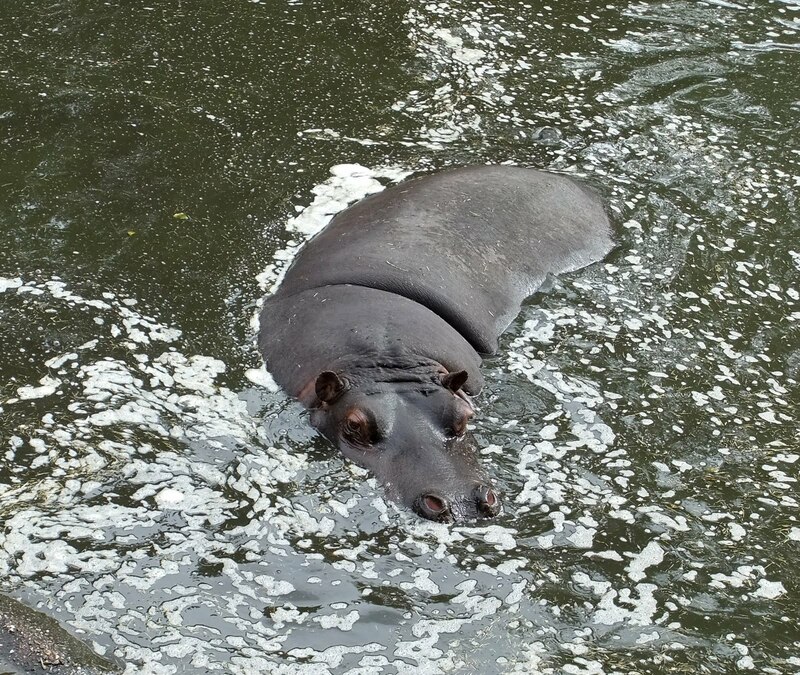 If, moreover, a hippo does decide to dive or swim underwater, a reflex action closes its ears and nostrils entirely, and it will commonly stay wholly submerged for 3-5 minutes - but may, if required, continue to do so for up to 30 minutes! And as the surfing hippos ably prove, if necessary it can indeed swim unaided by terra firma beneath its feet. Equally interesting is that despite their far-from-streamlined form, hippos are able to attain some nifty turns of running speed - even underwater. One hippo was timed charging along the bed of a river at a highly respectable 5 miles per hour, in spite of the appreciable drag effect of its watery surroundings acting upon it. And on land, hippos can readily outpace human runners, having been timed at up to 30 miles per hour - so beware! Certainly, hippos, in spite of being predominantly peaceful creatures, have acquired a formidable reputation as arguably the most dangerous animal to humans in Africa - adult females are notoriously ferocious if challenged or disturbed when they have calves. Their weapons are of course their colossal mouths, armed with huge curving tusks. Including their gum-embedded roots, the lower canine teeth of a hippo can sometimes grow up to 3 ft long - the length of an average human arm! And when a male hippo opens its stupendous jaws to yawn - not an indication of boredom, incidentally, but a sign of aggression toward another male seeking to invade its territory, or of courtship intent toward a female - the resulting gape can be up to 150°. 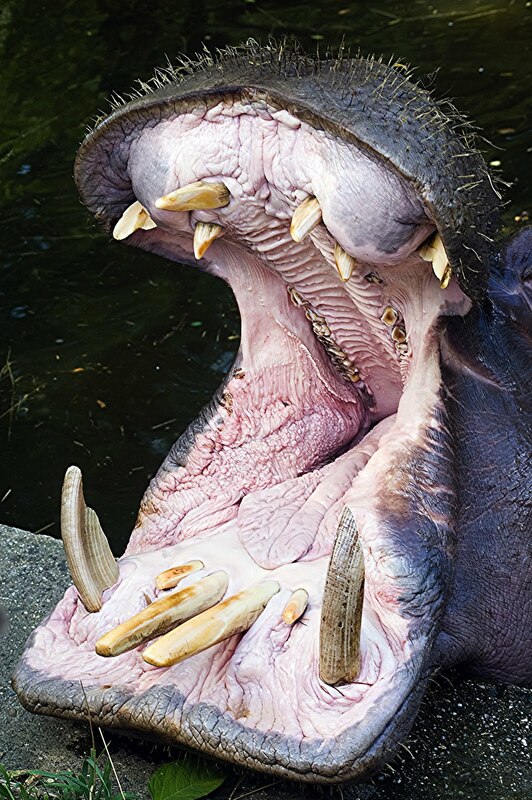 Only whales among mammals can outgape a yawning hippo! Indeed, it has been claimed that a hippo can open its jaws wide enough to accommodate a 4-ft-tall child inside! And this beast's mighty maws are so powerful that an adult specimen can bite a 12-ft-long crocodile in half! But even when not chomping a croc, male hippos fighting for territory can inflict terrible wounds upon each other, and even kill one another, with their huge curved tusks. So tough, in fact, are these awesome teeth that little more than a century ago hippo ivory was popular among dentists for use in manufacturing human artificial teeth - once they had succeeded in dissolving with acid the yellow enamel covering the ivory, because this enamel is as hard as glass and accounts for a third of each tusk's total weight! 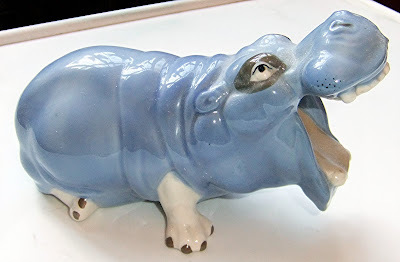 Much further back in time, the ancient Egyptians carved amulets for babies out of hippo ivory, believing that this substance had the power to ward away demons. Furthermore, the Egyptian goddess of childbirth, Taueret, was popularly portrayed as a bipedal hippopotamus. Undoubtedly, the hippo attracted great interest from early humans, and not just on account of its huge size and formidable jaws, but also due to the longstanding belief that it could sweat blood. The explanation for this curious but totally inaccurate notion is that in order to ensure that its thick, almost-hairless skin remains supple and moist when out of the water, and also to avoid it becoming sunburnt, the hippo secretes a sticky, oily, pink-hued substance from glands beneath the surface of its skin, which on first glance can appear a little like seeping blood but is in reality an efficient, ready-made sun-block! It may also act as an antibiotic, helping to promote germ-free healing of wounds inflicted upon each other by bellicose male hippos. 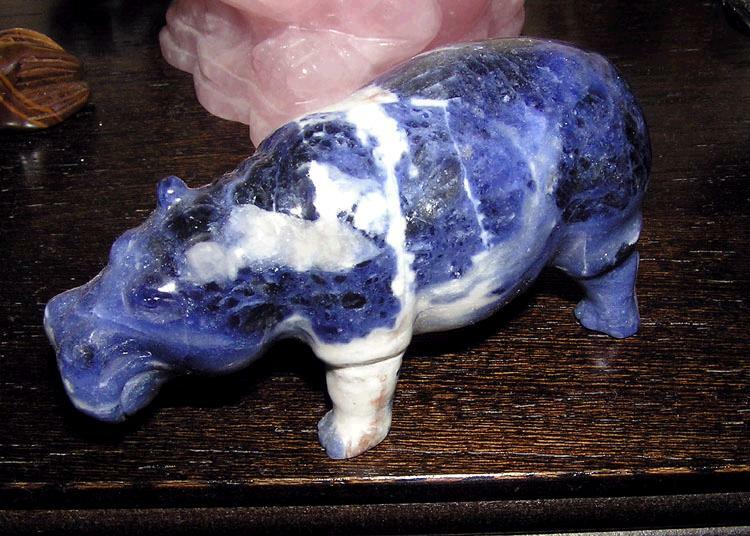 Another of the hippo's secrets, conversely, has only been revealed quite recently. 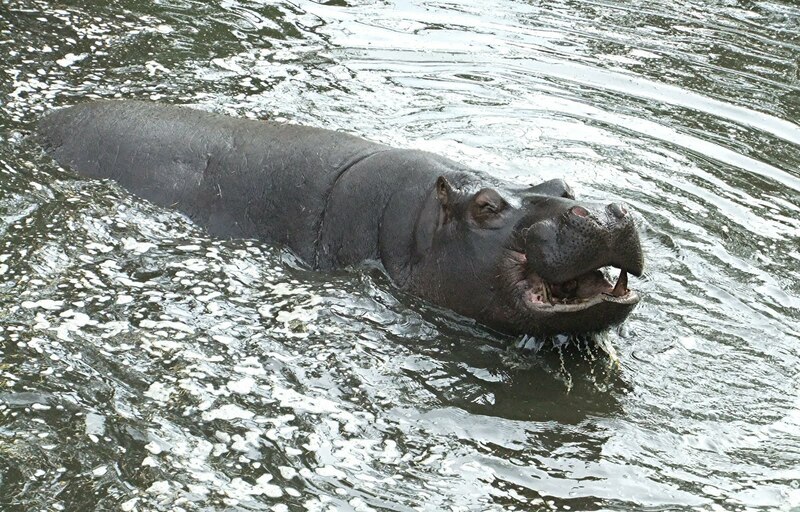 Not surprisingly, for a creature that spends so much of its time partly or fully submerged, the hippo is able to vocalise not merely on land but underwater too - thanks to a stentorian voice and powers of vocal projection that would put even the most skilled of human opera singers to shame. Hippos can communicate with one another directly through the medium of water via ear-splitting bellows of such potent force that they can be both heard and physically felt by anything positioned up to 50 ft away! But that is not all - scientists have lately discovered a hitherto unsuspected infrasonic component to this bellow, an amazing rumble beneath the threshold of human hearing but which can be detected underwater by other hippos as far away as 18.7 miles! No less amazing than its voice, however, are the eyes of the hippo - due to the bizarre shape of their pupils, each resembling an inverted, smooth-cornered capital 'T'! Yet again, this is an evolutionary adaptation to assist the hippo in its amphibious lifestyle, for it uniquely (among mammals) enables the hippo to see above and below the water surface with the same intensity of light, thus yielding a complete view, unimpeded by the water. Less familiar, smaller, and much daintier than the well known, common hippopotamus is the much more terrestrial, forest-dwelling pygmy hippo Choeropsis (=Hexaprotodon) liberiensis, which looks more like an over-sized shiny-black pig than a hippo. For many years, the very existence of this reclusive animal was discounted by science, in spite of longstanding native testimony and reports brought back to Europe by western travellers. Some even attempted to dismiss it as nothing more than a freak, stunted version of the common, larger species. As noted in my book The New Zoo: New and Rediscovered Animals of the Twentieth Century (2002; new, greatly-expanded edition due out later this year!!! 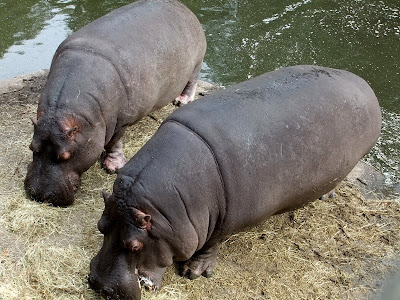 ), not until five living specimens were brought back alive by German explorer Hans Schomburgk in 1913 was the pygmy hippo scientifically accepted as a second, valid species of hippopotamus in its own right. Most remarkable of all, however, is that there could even be a third, supposedly long-extinct species of hippo still awaiting scientific detection - on the island of Madagascar. 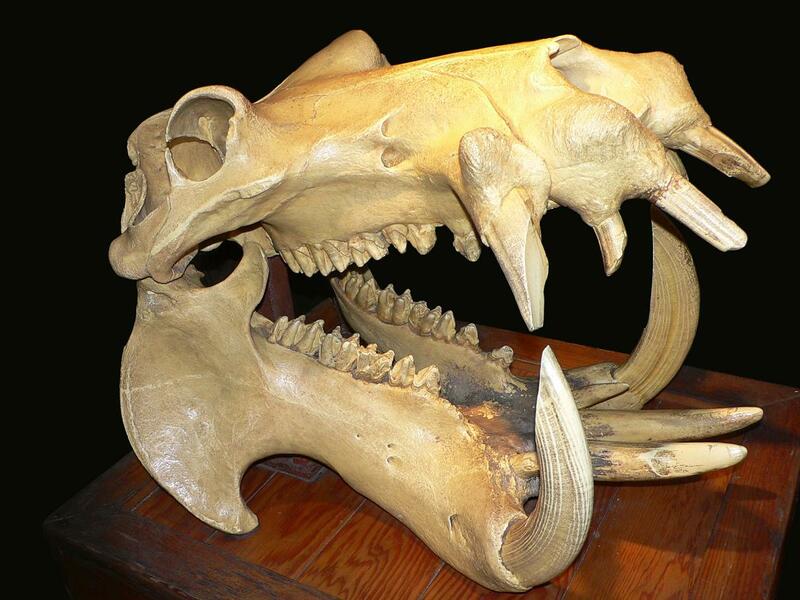 Several millennia ago, at least three different species of undersized, dwarf hippo existed here, but these are officially deemed to have died out long ago. 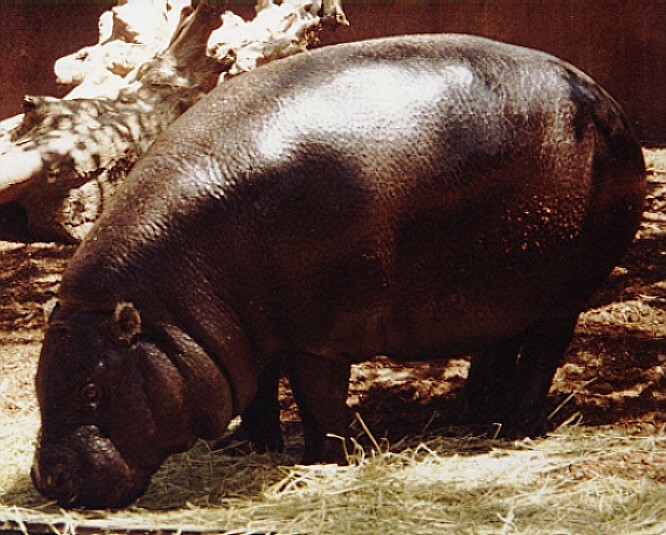 However, even today locals in southwestern Madagascar occasionally claim to encounter a shy, unidentified mystery beast that they refer to as the kilopilopitsofy or tsomgomby, which, when described by them, sounds irresistibly similar in both appearance and habits to a small form of hippo. Even the alleged vocalisations of the kilopilopitsofy seem remarkably reminiscent of the bellows of a hippo. Clearly, the fascinating realm of the river horse - the literal translation of 'hippopotamus' - may still have some hefty surprises in store! 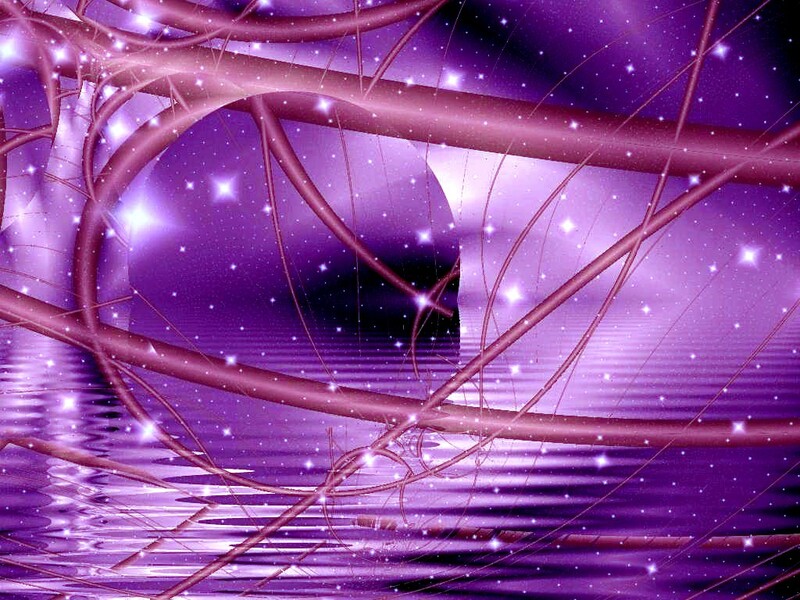 NB - Unless stated otherwise, all images included in this post are, to the best of my knowledge, in the public domain.